I got back to Austin around 8 am last week ready for three weeks of pure relaxation. No school, no work. Just me, good food, the heat, and a blasting AC. I thought I would spend my time recharging by doing nothing: catching up on Netflix, maybe a dip or two in the pool, some errands here and there, but otherwise nothing special. Just my typical routine while in Austin. As someone born and raised here, I am the worst Austinite there is. There are tourists who have seen more of the city than I have. I partially blame it on my parent's lack of enthusiasm towards the city. They love it here but chose to settle here when they came from Nigeria because of a relative who lives here, not because they were ready to jump into the music and food scene or explore all the city has to offer. Realistically, my lack of Austin experiences also stems from not driving. Maybe when I'm 30 I'll be able to overcome my anxiety and learn to drive, my faith in myself on this front isn't very high. 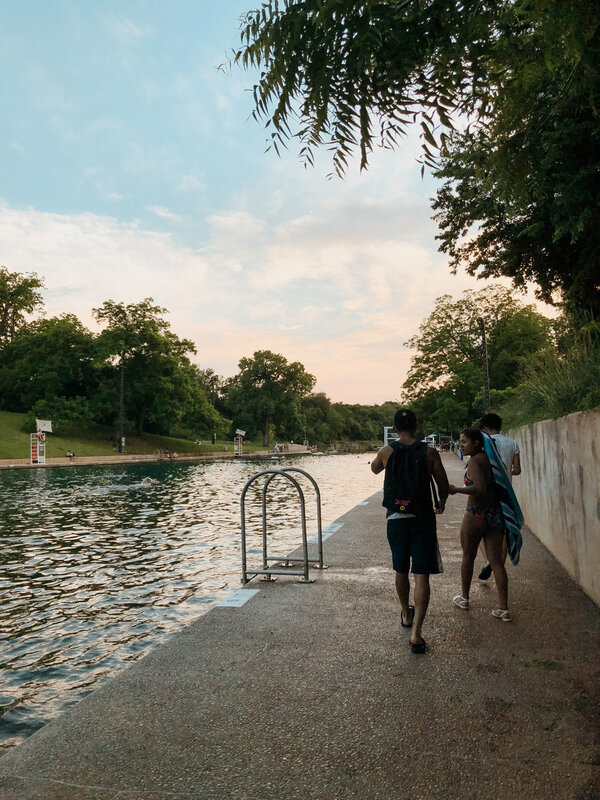 Either way, I've missed out on a lot of classic Austin experiences growing up and as the city has rapidly changed, there're some things that I'll never get to authentically experience. I always thought that college would be my time, the time when I would properly explore every nook and cranny, find my favorite spots and hold them close to my chest, but that's not quite how life decided to play out. NYU was my dream school since sophomore year of high school and while I'm beyond happy and excited and grateful to be there, I never fully imagined my college life in New York. I spent 18 years growing up in the UT mindset and while it wasn't my goal, I just felt like that's where I would end up– a girl who loves burnt orange and white, and flashing the hook 'em sign any chance she got. The only obstacle that stopped this vision from manifesting was the fact that I was waitlisted and then denied from UT (long story short, UT automatically admits Texas students who are top 7% of their class, I went to a small school, was ranked 4th which put me in top 7.27%, they don't admit a ton of Texas residents who aren't automatically in, blah blah blah). The eventual rejection stung like no other (I'm really smart! I look great in burnt orange! I already know "The Eyes of Texas"!) but made it easier to go after my dream school. There's no way I would have picked NYU over UT from a financial standpoint so with my decision already made for me, I headed off to New York to start living the dream. And then, a year later, my best friend got into UT. And we talked about our college experiences, and I saw her photos at games and parties, and around campus, essentially doing everything I thought I would be doing in college. But New York was great! And it's still great! And I have had the most wonderful experiences and I've explored museums and neighborhoods, and I've traveled and met amazing people and eaten great food. I’ve had some incredible converstaions and opportunities and I would not trade my experiences for anything. But this week I had the chance to pretend, just for a moment, that my college career existed on these forty acres and to explore the city that I thought I knew for the 18 years. I helped a friend move her stuff from the arcitecture building to her dorm, grabbed dinner at Dirty’s, ate at TacoDeli, HopDoddy’s and Chuy’s, swam in Barton Springs for the first time (!!!) and I got to do it all with my best friend and her best college friends—poeple who could have been my college friends had things ended up differenrtly. I spent a lot of time this week thinking “what if” to the point where I’m questioning the decision I made three years ago. What if college looked like football games and tailgating? Like coming home on the weekends and late night Whataburger runs? I know that I’ve had a wonderful time in college, and that I’ve worked hard to get where I’m at and that I’m in new york for a reason and that it’s such a good place for me, but it’s hard to shake the vision you created in your head for 18 years, especially once you’ve gotten a taste for it. This is one of the few times that I’ve really felt like I’ve had the chance to know my city and understand what makes it so special. Sure, I will rep Austin til the day I die, but I have a different appreciation for it after taking a dip in the 70-degrees-year-round barton springs pool and watching the sunset, or loitering at HopDoddy’s trying to avoid a rapidly approaching thunderstorm. You never know how refreshing an agua fresca can be until you’re enjoying it in the Texas sun with a taco in hand and good company around. You don’t realize how a broken car AC can be a blessing until you’re driving on the highway, windows down just feeling the wind and realizing how s p a c i o u s this state is and how little you are in the grand scheme of things, but also how these little moments and details can be everything. The past week felt like scraped knees and dripping popsicles. It felt like sneaking out and causing trouble. It felt like a summer that you see in movies. It felt endless, it felt wonderful. It is a start to what will be a great summer. This week has made me more homesick than distance ever could. This week has made me consider going to grad school, just so I can be a UT student (man my parents would be so! stoked!). And while this week has made me feel nostalgic for experiences that we’re never really my own, I know that new york is where I need to be in this phase of my life. That city has so many memories, and places and heartbeats that I love so dearly. It’s been nice to fantasize, but that city is my reality, and the picture it depicts is priceless and precious. I have the chance to properly explore every nook and cranny, find my favorite spots and hold them close to my chest, and that’s exactly what I intend to do for however long I find myself there. New York is my home, too. And while I probably know new york better than Austin, that doesn’t mean I love Austin any less. How lucky am I to have two wonderful cities to love? Regardless of my experiences or lack of, Austin you are home. And I can always come home. And I will always come home.